Cremated ashes are not property and can't be divided, a Florida judge ruled, in an ongoing legal fight that has involved bizarre legal twists, a polo-playing billionaire defendant, juror misconduct and feuding parents. The remains of Scott Patrick Wilson, a 23-year-old who was killed four years ago in a hit-and-run by a Florida tycoon in a Bentley, are the subject of a protracted custody battle between his divorced parents. A state appeals court ruled last week the ashes cannot be divvied up among the principles. But the case is far from over, both for the family of the victim and the billionaire convicted of killing him while under the influence. For Wilson's grieving parents, whose bitter divorce in 2007 — three years before Wilson died — has prompted them to quarrel over everything from baseball cards to their son's remains, the case of what will happen to the ashes is still making its way through the legal system. Same goes for John Goodman, 50, who was sentenced to 16 years in prison in 2012 for the killing but has since been put on house arrest while he awaits a new trial because his conviction and sentence were overturned due to a juror's confessions in a book he wrote about the case. 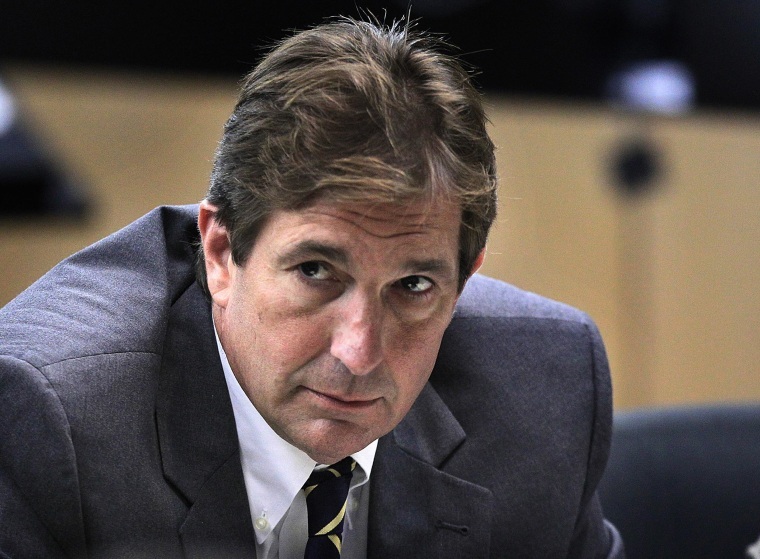 Goodman's second trial is tentatively scheduled for October. The legal mess stems from the Feb. 12, 2010, car accident, when Goodman, founder of the International Polo Club Palm Beach in Wellington, Florida, ran a stop sign in his luxury convertible. He hit Wilson's Hyundai Sonata, according to trial evidence, sending Wilson's car careening into a canal. Prosecutors said Goodman, whose blood alcohol level was twice the legal limit, then walked home and waited an hour before calling 911, while Wilson drowned. In May 2012, Goodman was sentenced to 16 years in prison — just under half the maximum time he faced. But Goodman's attorney asked for a new trial after it was revealed that one juror, Dennis DeMartin, self-published a book about the trial. In the book, he wrote that the night before the jury reached its verdict, DeMartin had four drinks to see how impaired Goodman would have been after consuming that much alcohol. As Goodman waits for his new trial under house arrest, the parents of Wilson, a recent engineering graduate, have been arguing over where their son's final resting place should be — although both agreed to have his body cremated. Wilson left no will. Two years ago, William and Lili Wilson settled a civil lawsuit against Goodman, in which the parents evenly split $46 million before attorney fees, the Sun Sentinel reported. But now, their legal focus is on their son. Wilson's mother, Lili Wilson, wanted his ashes in West Palm Beach, Florida, where Wilson grew up before going to the University of Central Florida in Orlando. William Wilson Jr., his father, wanted his ashes in a family burial plot in Blue Ridge, Georgia. Wilson's father petitioned the court to declare the ashes "property" that could be divided into two containers, entitling each parent to half of the ashes. But his ex-wife opposed having the ashes divided for religious reasons. Joy Bartmon, William Wilson Jr.'s attorney, said that long before he and his wife divorced, a headstone had been engraved in the family burial plot with the names of the whole family, leaving only their dates of death unwritten. "Though he wanted Scott's ashes buried in Georgia, Mr. Wilson was willing to share them with his former wife, as they had shared Scott in life," Bartmon told NBC News via email. "Scott was the last male Wilson of his line. William Wilson believes that Scott should be put to rest with the other Wilsons from which he came, in Georgia." Kristina Pett and Amy Beller, attorneys for Lili Wilson, said they could not speak on their client's behalf, but confirmed that the case over the ashes is now likely to go to a lower court. The state court gave co-personal representatives for the father and mother 30 days from last Wednesday to find a place to bury Wilson's ashes; if they can't reach an agreement, the court is likely to appoint a curator to carry out the task. In coming to its decision over whether remains could be considered property, the court looked far back in history to consider how deceased bodies have been viewed over time, starting in 1753. It also cited a more recent, similar case in Florida from 2005, which declared, "a dead body is not properly viewable as property or assets," and a 2007 Pennsylvania case that also had echoes of this one. "Given the sensitive nature of the subject matter, and the fact that, historically, cremated remains have been treated the same as a body, neither constituting 'property,' we decline to craft a policy at odds with our history and precedent," the court wrote. "This is a matter best left to our legislature should it decide to address this sensitive policy issue." William Wilson does not plan to appeal the ruling, his lawyer said. Until a final decision is made, Wilson's remains will stay in an urn at a Royal Palm Beach funeral home, the Palm Beach Post said.